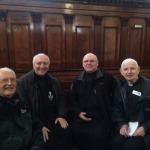 The annual Passionist Companions Day was held at the Mount Argus Meeting Rooms on Saturday, 22 November. Companions were present from Mount Argus, the Graan, Crossgar, Prestonpans and Paris. Fr Paul Francis gave a talk at the morning session on the meaning of the Passionist Companions’ Consecration. In the afternoon reports on the year of ‘Invitation, Formation and Consecration’ were given by the various groups present. 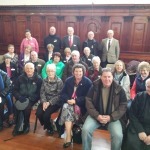 About forty new members have joined the Passionist Companions as a result of this process. The day concluded with the Vigil Mass of the Feast of Christ the King celebrated by Fr Frank with Frs Ephrem, Victor and Paul Francis.